Hawaiian chicken skewers are an easy grilled recipe loaded with protein, vegetables, and fruit. Tender pieces of chicken thighs get marinated in a pineapple teriyaki sauce for a boost of flavor to the island-inspired dish! Hawaiian chicken skewers are the perfect solution for an easy to make grilled appetizer or entree with bold island-inspired ingredients. Adding pieces of vibrant, colorful fruits and vegetables like zucchini, bell pepper, red onion, and pineapple chunks deliver flavor and nutrition. Before the chicken cooks, it gets infused in a pineapple teriyaki marinade to maximize the sweet and tangy notes on the surface. The smoky and lightly charred grilled chicken drizzled with sticky sauce makes for amazing handheld kebobs. The visible flavor on the surface! The salt in the soy sauce acts as a brine, helping to move water molecules in the meat, making the meat juicier. The natural acid in the pineapple juice and rice vinegar help to tenderize the meat in a short time, minimum 30 minutes. The sauce mixture is divided up into the reserved marinade, leaving the remainder to make a sticky sauce that clings to the Hawaiian chicken. Just a small amount of cornstarch slurry functions as a thickening agent, adding viscosity and richness to the sauce in just minutes. If using wooden skewers soak them in water for at least 30 minutes to prevent quickly burning. Cut the protein and vegetables into comparable sizes for even cooking time. Thread the ingredients, so they’re similar in shape for even contact with the grill plates. Place ingredients close together, with a small amount of space between so that the heat can distribute around the food, especially the chicken. Always clean and oil the grill before cooking to help prevent sticking. Pre-heat the grill before you place the chicken down. Cook until the chicken is no longer pink or reaches 165ºF (74ºC) on an instant-read thermometer. This recipe is reminiscent of trips to the Hawaiian islands, with the flavors reflecting staple island ingredients. Once I learned the easy method for how to cut a pineapple, the taste of fresh fruit is always preferred over the canned. The combination of fermented soy sauce, pungent ginger, and garlic for the teriyaki sauce is an excellent base for many island dishes like tuna poke which is also a favorite dish in Hawaii. Just like you would find on a lunch plate in Hawaii, I would serve these chicken skewers with macaroni or potato salad and rice, or cauliflower rice for a low carb option. It’s an easy chicken recipe that will disappear quickly hot off the grill drizzled with more sauce! It’s always a great debate between using chicken breasts or chicken thighs for grilling. Lean pieces of breast meat give nice chunks. However, they can quickly dry out if cooked too long so keep a close eye on doneness. I recommend using pieces of boneless, skinless chicken thighs. The slight increase in fat prevents the chicken from drying out as quickly when in contact with the high heat of the grill. 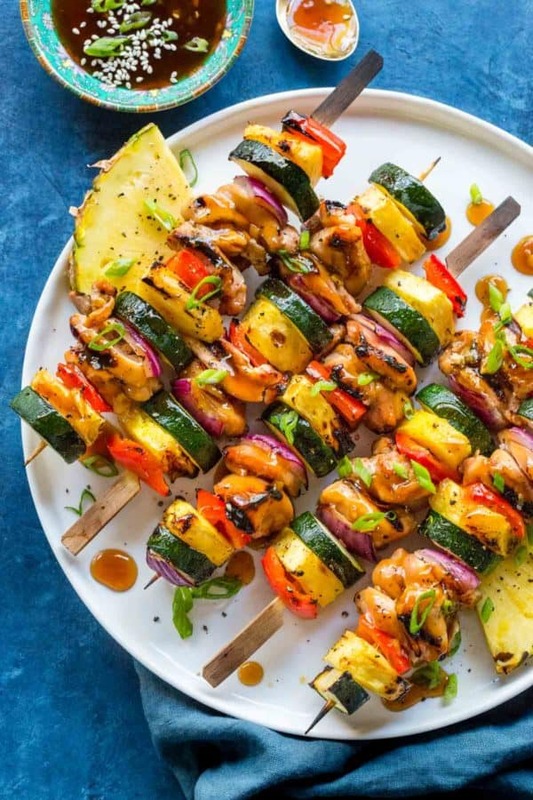 Grilled Hawaiian chicken skewers loaded with pineapple chunks and vegetables. Chicken thighs get marinated in a quick homemade teriyaki sauce. If using wooden skewers, soak in water for 30 minutes before cooking. 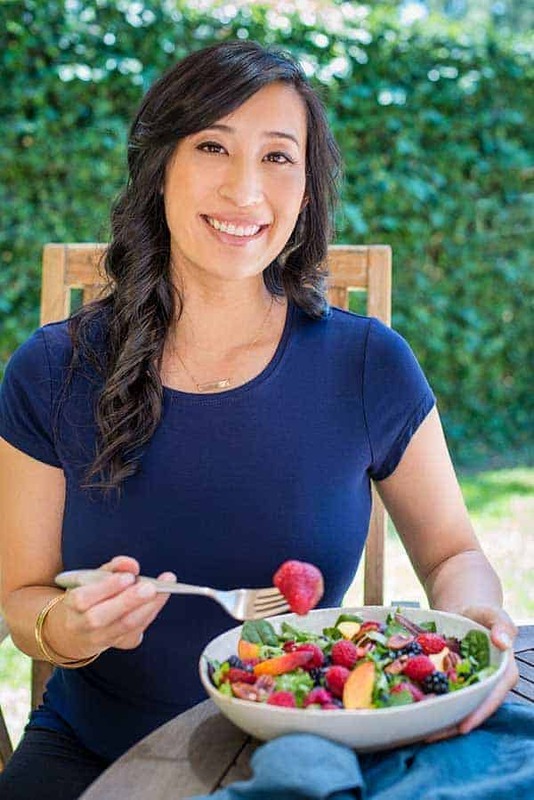 In a medium-sized bowl whisk together soy sauce, pineapple juice, honey, rice vinegar, mirin rice wine, sesame oil, ginger, and garlic. Reserve ½ cup of the teriyaki sauce mixture. In a resealable plastic bag and diced chicken and ½ cup of the reserved teriyaki sauce mixture. Marinate the chicken for at least 30 minutes or overnight in a refrigerator. Add the remaining teriyaki sauce mixture to a small saucepan, should be about 1 cup. In a small bowl mix together the cornstarch and 2 tablespoons of water to make a cornstarch slurry. Bring the sauce to a boil over medium-high heat and cook for 1 minute. Add the cornstarch slurry to the boiling sauce, and whisk to combine. Continuously stir until a nice and thick sauce coats the back of a spoon, 30 to 60 seconds. Set sauce aside. Thread marinated chicken, red bell pepper, pineapple chunks, zucchini, and red onion on the skewers. Add a small amount of vegetable oil on a folded piece of paper towel, and then carefully grease the grill with the oil. Once the grill is very hot, add the chicken skewers and discard the marinade. Cook on one side uncovered for 4 minutes. Cook on the remaining sides for 2 minutes per side, or until the internal temperature of the chicken reaches 165°F (74°C). Remove chicken from the grill, glaze skewers with more sauce and garnish with green onions. Serve extra teriyaki sauce on the side and season chicken skewers with salt and pepper as desired. Brown sugar or maple syrup can be substituted for honey. MAKE IT PALEO: Use coconut aminos instead of soy sauce, maple syrup instead of honey, and 2 teaspoons arrowroot powder instead of cornstarch. Thank you SO much Judy! If you ever have a chance, I would love to hear your feedback on the chow mein over on that recipe page. So thrilled to hear that everyone enjoyed it 🙂 Hugs! 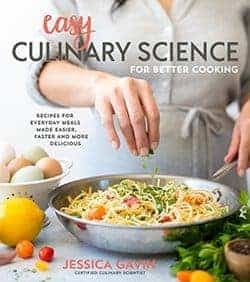 This looks fabulous Jessica… will have to make this one!!! These skewers were delicious! The marinade left the thighs nicely seasoned and juicy. I loved the teriyaki sauce! I have never grilled with chicken thighs. My one inch cubes were pretty sad looking! Do yo think you could grill the thighs whole and make the skewers on the side? This is going to be a go to easy dinner. You can prepare everything the night before and stick it on the grill when you get home. Thanks again! Thank you Katie! I think I will change the size of the recipe to 1 1/2 inch cubes. Also, if the pieces were small, I double them up, side by side on the skewer so it feels meatier. Yes, you can absolutely marinate the whole thighs and then grill them. Glaze them with the teriyaki sauce after, yum! Great idea to make veggie skewers, and you can mix up what you add too, like mushrooms 🙂 You’re welcome!